Ristorante Farfalla's original recipes blend the flavors of select regions of Italy. Each item is presented as a work of art. Chef Michael Fattah personally orchestrates his culinary team each evening as they prepare special dishes to delight his patrons and enhance his standard menu. Please select a section below to review our current menu offerings. 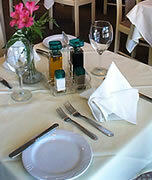 All our dishes are cooked to order. This requires time for preparation.